Grotesque! Chaotic! Jolly! Depraved! Alluring! Sexually aggressive! These are feelings people have about the work of Dutchman, Willem de Kooning (1904-1997)- especially about his depictions of women. 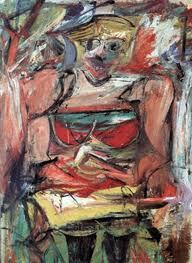 The above work, “Woman V,” took de Kooning 2 years of painting, scraping, ripping and re-painting…the year 1952. Notice his brush strokes, his color, the way he almost attacks the canvas. What a painting! In 1986, he was awarded the National Medal of Arts, and in 2006 one of his series of “Woman” sold for $137.5 million. What is your reaction to this painting? My eye is all over the place when viewing each of these paintings. Definitely a very chaotic feeling. What a wonderful blog! Every post is a lesson in Art History! Please, please, please keep them coming! Hello there, just become aware of your weblog through Search engines, and located that it is truly informative. I’m going to watch out for brussels. I will be grateful for people who continue this particular in future. Lots of folks will likely be benefited out of your writing. Many thanks! Kirby, you’re amazing. You’re forever learning, and now with the blog you have a great vehicle to share it all with all of us. I look forward to seeing what’s coming. 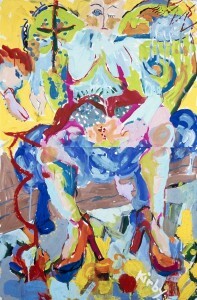 I was fortunate to see the DeKooning exhibit at MoMA. He’s fabulous, one of my favorites. I was really struck by the extreme aggressiveness , mysogynistic quality of all the Woman paintings – those were not my favorites, but they’re strong, that’s for sure. Your painting is definitely happier, funny, strong in a fun and life affirming way. He was alcoholic and, I suspect, not very nice. You can copy him in some ways, but your lovely spirit just can’t copy his mean one! Good thing too! Your website is not just informative however really creative too. You will find frequently really several people who may write not simple content articles that creatively. Continue the excellent writing !! I really love your blog! I need some more time learning and exploring all this wonderful and interesting information. I plan to share it with one of my budding artist as well. Woodrow, my middle boy you sketched, is very artistic. We just moved and my painting has a much more prominent spot in the new house. People always comment on this fabulous piece. Hope to see you soon. Missing you and ShanyBanan. please send photos of boys!! !